Street art that occupies space on private property creates discourse about ideas of identity, territory and collaboration. 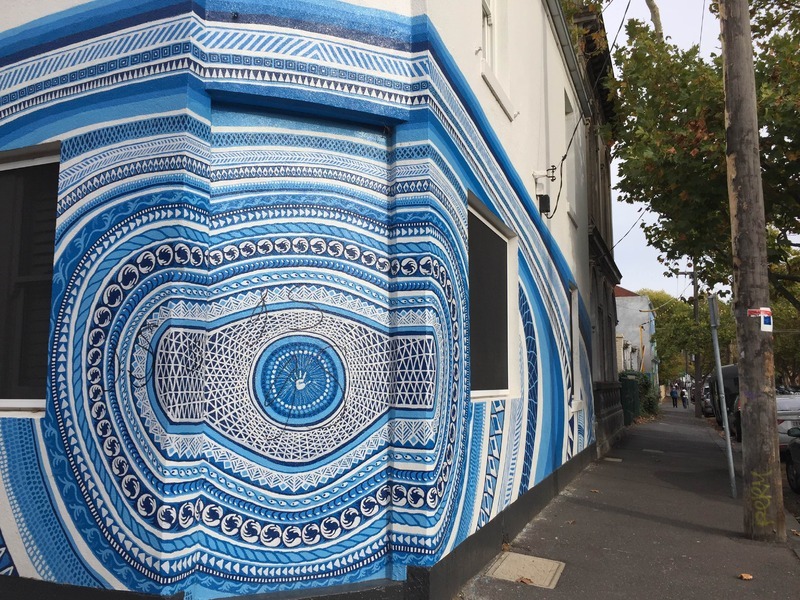 This commissioned mural for a private home on the corner of George and Moor Streets in Fitzroy has allowed the building to become somewhat of a landmark. The piece adds cultural and historical value to not only the building, but also the wider neighbourhood as it allows residents to belong to a subculture. If commissioned, as seen above, street art has the ability to add personality to the building. It acts as a point of difference, and a means of expression of its residents and the neighborhood. Some property owners have a desire to express themselves through commissioned art and decorating the façade of their homes. On the other hand, if not commissioned, street art, or graffiti in this case, in the form of tagging etc on private property can be seen as disrespectful and a violation to the building owner. Furthermore, having to clean it up becomes a great cost to the community. At the time of taking this photo, the commissioned mural had been tagged over. It is interesting to consider whether the homeowners will choose to remove the tag and restore the mural. If not, is this a way of them saying that despite the mural being technically on private property, it is open to be treated as any other piece of street art would be- open to the acclaim but also the criticism of the wider community? This raises the interesting question of who owns public art illegally placed onto private buildings? “Stop 5: Corner George St and Moor St, Fitzroy,” Street Art deTours, accessed April 24, 2019, http://streetartdetours.com/document/1113.